But there is a concern that saying something may open one up to ridicule and censure in a culturally hypersensitive atmosphere. But we do want an armored bread truck to deliver the adequate resources, personnel and equipment that mitigate loss of life and property in an emergency event? For authorities charged with reconciling these contradictions, the messaging is paramount. Free societies are challenged with reconciling an openness of thought and opinion with the dictates of public safety strategy and tactics used to keep us safe. The nexus between public safety and sociocultural respect and liberty resides in the ability of the public safety sector to articulate its mission and values and explain its actions with transparency. At either extreme, fear stems from a perception of proximate harm lingering just below the surface of individual or governmental actions. In both cases, responsible public safety professionals must communicate cleanly and clearly the purpose and intent of their actions that will allay those fears. In uncertain times, the potential for fear and overreaction is often directly proportional to the perception of composure and control projected by the person(s) in charge. For public-sector authorities, this requires that statements and actions be supported by empirical data, forensic evidence, logical and factual analysis and comprehensible conclusions. Of course, facts are still stubborn things to which all points of view and the spectrum of emotions may not be categorically amenable. However, history would appear to be on the side of the American response to crisis and the free society’s ability to make the necessary adjustments without crossing the zero-barrier protecting individual rights and collective tolerance. In these times of increased anxiety and scrutiny, public safety and homeland security institutions are encouraged to project confidence and transparency when communicating local and federal public safety measures and responses. To that end, we must continue improving upon the veracity of open press conferences. To assure a clean and clear rendering of events, more local agencies should be encouraged to employ the use of public information officers (PIOs), who possess the skill sets to deliver critical information in a way that is easily digestible for public consumption. PIOs are often not available to smaller agencies that lack room in the budget for such an intermittent position. In a 24/7 information society that is tied to social networking, opining and the invariable initial misstatements, prioritizing messaging is a worthy consideration for federal grants. Second, we should consider the creation of “safe zones” for reporting suspicious activity, where well-intentioned individuals can report suspected behaviors free from judgement, bias and external interpretations of their intent. We should communicate these safe zones to the public and offer digital, telephonic and in-person methods of reporting. Efforts must be made to publicly assure that responsibility for vetting facts and circumstances of suspicion is placed on the proper authorities, absent any social retribution against honestly derived tips. This mechanism addresses both ends of the spectrum and respectfully reconciles the needs of tolerance with tangible public safety and threat mitigation measures. Finally, outreach and collaboration with community groups must continue to grow. Fostering these relationships creates a synthesis of information that cannot be overlooked. Partnering with faith, youth, business and civil right groups, etc., promotes positive communal and human interests. Collaboration with community-based sources also adds social legitimacy to information streams derived from “seeing and saying,” while enhancing practical and tactical responses to any threats they reveal. Ultimately, the primary value may lie in the potential to consolidate citizen-community-state relationships by strengthening the ties that bind us together in our collective and united desire to achieve the best quality of life. Policy must establish procedures for taking, and explaining, the actions that balance the fulcrum between liberty and security. This is vital in the moment, where concerns and fears are bred, but perhaps even more important for the sake of history and posterity. Consider the extreme example of Abraham Lincoln’s suspension of habeas corpus, “liberty of speech,” and “liberty of press” in 1861. Fortunately, modern communications are capable of memorializing security decisions in a much more detailed and transparent roadmap. Social and mass media have assisted the United States in unparalleled success at fending off advances against freedoms, while maintaining the mandates of individual liberty. 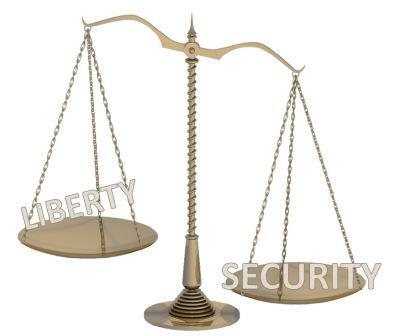 Still, political considerations and aspirations have an indivisible influence on the balance of liberty and security. The temptation to succumb to pressure from the vicissitudes of public opinion is ever-present. Author: Donal Hardin is a retired policing and corrections professional specializing in public safety ethics. Having filled various roles at institutions of higher learning, Donal is currently teaching criminal justice coursework. He can be reached at [email protected].